A file photo of Crocs. 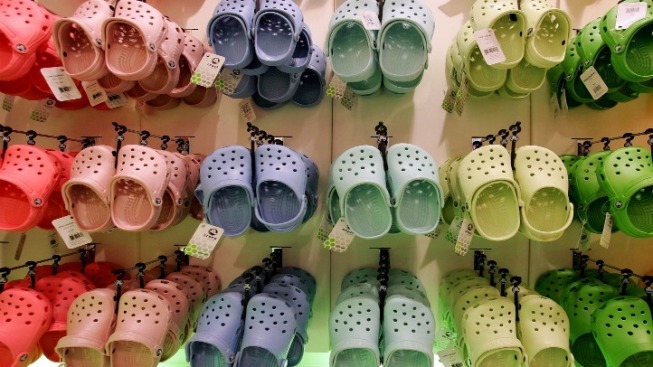 Crocs announced that it was closing the last of its manufacturing stores on Tuesday, but the footwear company asserted that it was not going out of business. The company did not offer explanations as to how it would continue to manufacture shoes, sending fans into a Twitter frenzy. Still, the company asserted that it was not going out of business. Crocs did not respond immediately to CNBC's request for further comment. Shares closed down 2.65 percent at $17.64 Tuesday after the announcement was made as part of the company's second quarter earnings release. The stock rose more than 3 percent in Thursday afternoon trading. Crocs reported earnings of 35 cents per share, beating the 31-cent consensus estimate of analysts as tracked by Thomson Reuters. Revenue for the quarter came in at $328 million, beating a FactSet consensus estimate of $321 million. The company still expects expects revenue between $240 million and $250 million for the third quarter, in line with consensus estimates, despite the closures. The company also announced that Carrie Teffner, executive vice president and CFO of the casual footwear brand, would be leaving the company next April. Teffner will be succeeded as CFO by Anne Mehlman, a former vice president of corporate finance for the shoemaker and the current CFO of Zappos.